This shampoo and conditioner for fast growing hair works best when they are used together and is specifically formulated to maximize a clean and nutrient rich environment as well as provide the optimal essential nutrients, amino acids and proteins not found in regular shampoos to prolong, sustain and maximize fast hair growth. Leaves your hair feeling clean, smooth and manageable. The FAST 2 pack (10 oz) is all you need to get started. Yes! FAST shampoo and conditioner really works. FAST works by feeding the hair with essential nutrients, amino acids and proteins not found in regular shampoos. This special blend provides essential nutrition to hair, allowing hair to grow as fast and as healthy as possible. This wide tooth brush is used for detangling long hair wet or dry. For really stubborn hair use it in the shower to comb conditioner through your hair. Hair can be especially fragile when wet, so using this wet dry brush will prevent any snapping or friction on the hair shaft. • Effective on both wet and dry hair to eliminate tangles and knots. • An intriguing hair brush solution in a classic style. • A pleasant brushing experience with seamless brushing to detangle your hair with ease and minimize breakage. • Soft , yet firm, thin bristles with rounded ends that keep hair from getting caught or pulled and gentle on the scalp. • When used with the Nisim Spray Conditioner you can effectively eliminate static. • Works best with FAST Conditioner. • Perfect for thick, curly or straight hair. • Can be used for all hair types and lengths including hair extensions and wigs. • For the Ultimate salon look to hair, use with FAST Shampoo and Conditioners to grow your hair faster! Where can I find the original formula? You can find the Original Formula here. Is this product a relaxer or strengthener similar to something like Brazilian Blowout? FAST Shampoo and conditioner intended purpose is to help hair growth speed but it can still help with smoothing the hair. Be relieved that FAST works with chemically treated hair such as keratin treatment, and different hair types such as Afro American Hair or hair conditions such as oily hair. 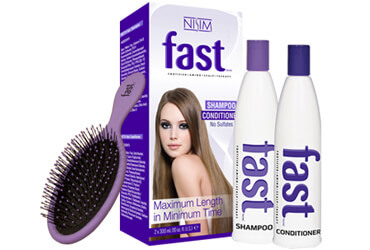 Is FAST formulated as a dry shampoo? 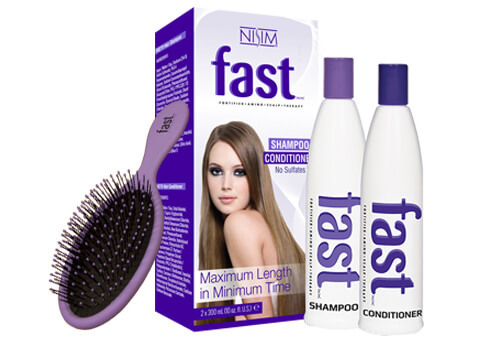 FAST Shampoo is not specially formulated to function as a dry shampoo but it will help moisturize and nourish your hair without leaving it matte and greasy. Can I combine F.A.S.T.® with your NewHair Biofactors® products? Yes. Combining F.A.S.T.® with our NewHair Biofactors® line is completely safe. We recommend you cycle the shampoo/conditioner applications between products, use each every other day intermittently. Will my hair continue to grow at an accelerated rate if I stop using FAST? Will this grow back lost hair or provide hair regrowth? No, if you are looking to restore lost hair please see our hair restoration products on our site.